Buffer - to lessen or moderate the impact of something. 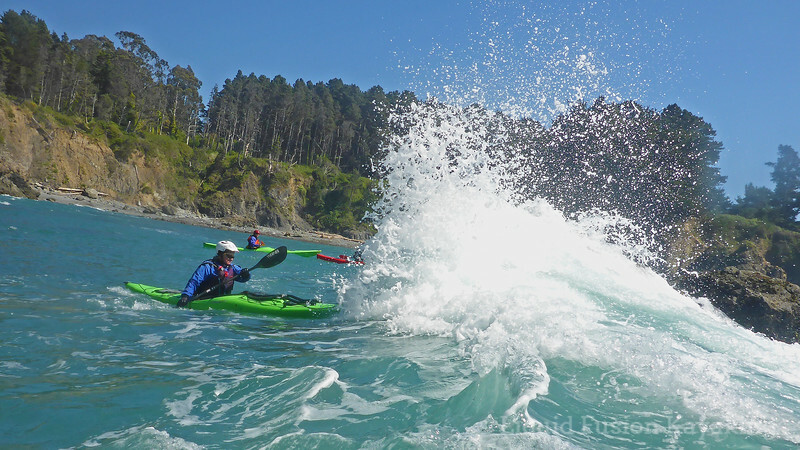 When kayaking among ocean rock gardens, it is helpful to know where safe zones are. Knowing and using these safe zones will allow one to paddle in close to the rocks and to access more areas and play spots. Deep water (where waves aren't breaking) are obvious safe zones. There are also areas in rock gardens where we can find safety from breaking waves. We can hide behind a rock when the wave comes and let the rock take the impact of the wave and lessen or buffer it's energy. Have you ever gone out into the driveway when your significant other is washing the car? Perhaps, they are feeling a bit ornery and try to spray you with the hose. By ducking behind the car, you can avoid the full blast of the hose. This is the same with using rocks as buffers in the ocean. We refer to these areas as buffer zones. Jean sitting in a buffer zone behind a rock during a Liquid Fusion Kayaking Rock Garden Class. Photo by Jeff Laxier. 1. Determine the direction of the waves. 3. Hold position as close behind the rock as possible when the wave hits. 4. Stay loose in the hips and potentially ready to brace as the water may surge under or around you. When the set has passed, journey to the next buffer zone. Whitewater river runners can compare this concept to eddying out and eddy hopping. Not all buffer zones are created equal just as all waves are not the same size and direction. It takes time to develop the water reading skills to recognize buffer zones and how to use them. 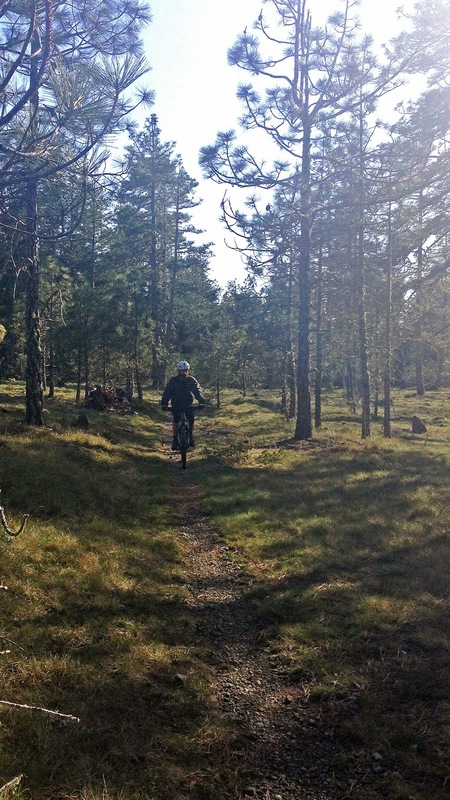 On your next rock garden journey, start looking for buffer zones and find small friendly ones to play with. 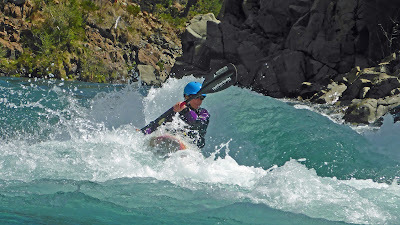 Each spring, Jeff and I dedicate 2 weeks to whitewater river kayaking. Sometimes we offer classes during this time through Liquid Fusion Kayaking, but typically LFK is closed as we run off to chase the spring run off and use the time to rev up for our busy spring and summer season. Spring run off trips often include traveling to destinations to do whitewater runs and almost always include a multiday river trip. 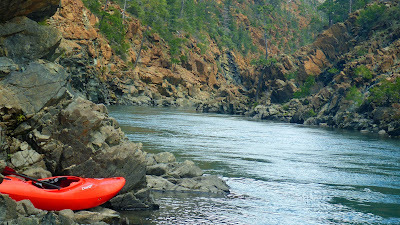 This year, we loaded up the whitewater kayaks, camping gear, and mountain bikes and headed north to the Smith River. Day one of our trip, we ran the North Fork of the Smith River. The North Fork of the Smith is among my favorite whitewater rivers. The waters are crystal clear. The scenery and plant life are unique and the rapids are fun. Eddied out for lunch on the North Fork of the Smith River. The 14 mile wilderness stretch feels other-worldly. The water is so crystal clear that one could get dizzy staring at the rocks when zipping down the rapids. Cate loving the crystal clear waters of the Smith River. Between stretches of whitewater, one can float along and ponder the geology of the arid hillsides and be enchanted by the song of the canyon wren. 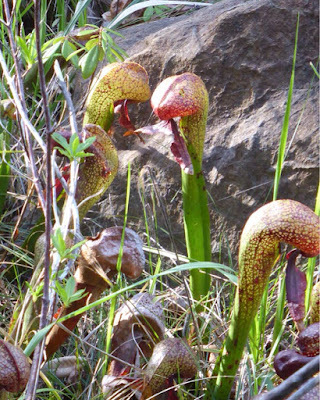 Springs of crystal clear water cascade down the hillsides and along their gulches and crevasses grow gigantic carnivorous plants. 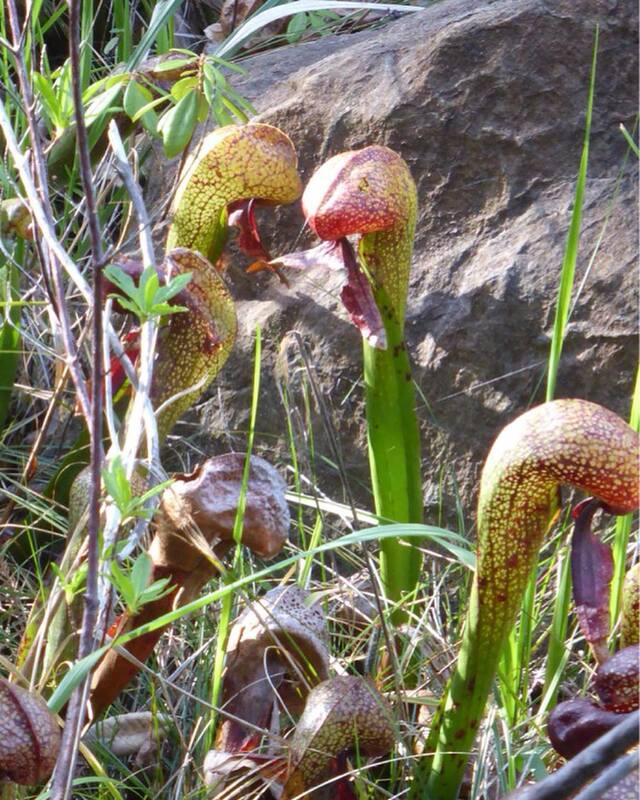 Gigantic carnivorous plants growing along the Smith River. 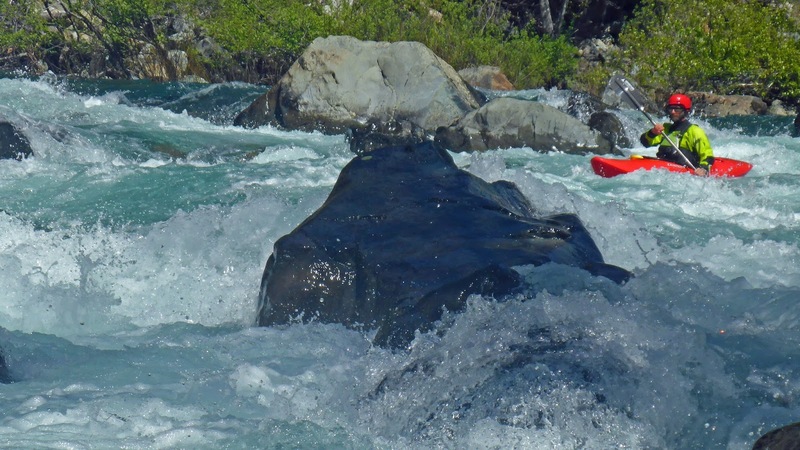 The whitewater rapids on the North Fork of the Smith are fun. There are lots of class III rapids with about 6-8 class IV rapids keep things fun and interesting. A huge thank you to groups like the Smith River Alliance and American Whitewater for their continued efforts to protect these waters from environmental threats like mining and advocating for access to river runners. Jeff and Paul enjoying a lunch break on the North Fork. After running the North Fork, we eddied out at our campsite on the Smith for about a week. 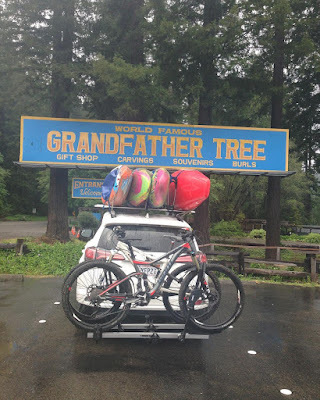 We enjoyed whitewater kayak runs on both the Middle and South Forks, mountain biking, camping, and hiking in the giant redwoods. 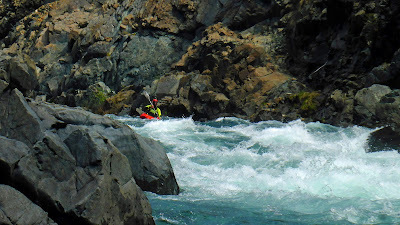 Jeff enjoying his Dagger Phantom on the Patrick Creek section of the Middle Fork. 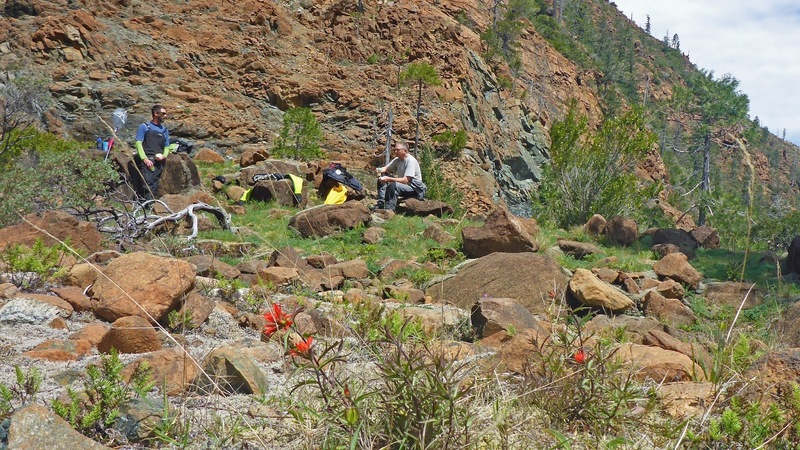 The diversity of ecosystems of the Smith River Watershed is amazing. 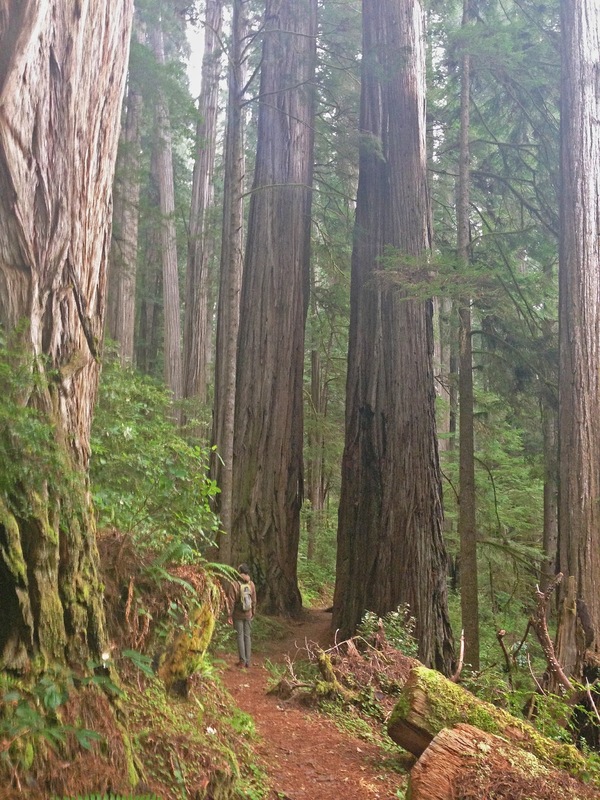 One of our mountain bike rides took us through 3 distinctly different types of forest - old growth redwood forest, cedar and mixed conifer forest, and Jeffrey Pine Forest. Jeff mountain biking through Jeffrey Pines on a ridge above the Smith River. 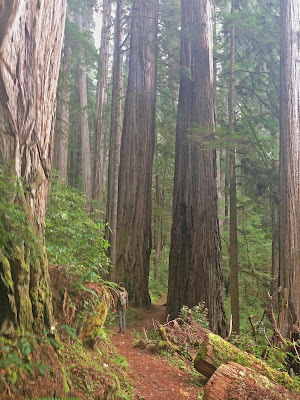 And the redwoods in the Smith River area are some of the tallest in the world. After a week on the Smith, we debated staying a bit longer. We could have easily spent another week boating, playing, relaxing, and exploring the area but felt the need to totally disconnect and do a multiday self support trip. We headed home to reset and gear up for a 70 mile Eel River whitewater kayak self support trip. Dehydrating spaghetti sauce for kayak camping. Our Eel River Trip was fantastic!!! Stay tuned for a blog post on our Eel River Trip - Paddling the Emerald Triangle. 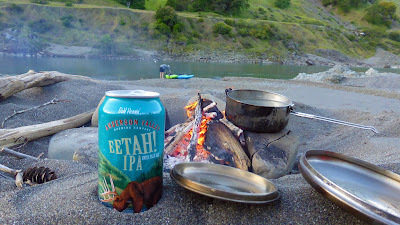 Cooking over the campfire and enjoying a tasty beverage on the Eel River.